Look no further for the perfect portable mobility scooter. For a portable mobility scooter small enough to fit in the boot of your car and packed with innovative features, look no further than the Pride Go Go Elite Traveller LX. The frame can be separated with one hand, and easily disassembles into 5 lightweight pieces. Perfect for storing at home or in the garage. 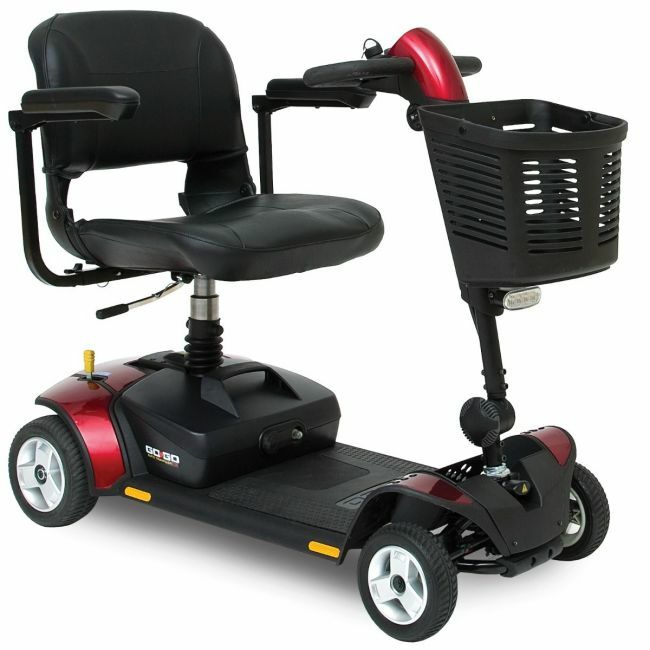 Make tight turns using one hand, and arrive at a safe and comfortable stop using the easy to operate brake handles. There is also a dial to adjust your speed, all the way up to a swift 4mph. An LED dashboard shows exactly how much battery power there is left, so you always know when it’s time to recharge. Charging the Pride Go Go Elite Traveller LX is easy. Choose to remove the battery and charge it away from the vehicle, or simply plug it in while it is fully assembled. Once fully charged, this lightweight mobility scooter can take you up to 10 miles on a single charge, making it the perfect companion for navigating busy pavements, for days out, or trips to the supermarket. There is a seat post suspension to handle uneven surfaces and solid non-scuffing tyres for increased durability. There is a generous basket on the front for storing groceries, and powerful LED lights at the front and rear so you’ll always be seen.